Lucca Ravioli Company’s parking lot at 22nd and Valencia Street, which went on the market in August, quietly sold in October for around $3 million — and now plans are in the works to develop it into a five-story residential building. The parking lot’s new owner — M3 LLC — filed a preliminary application with the city in mid-December. The plans for 1120 Valencia St. envision a five-story, 18-unit building with around 1,171 square feet of ground-floor retail and a rooftop deck. Two of the units will be below-market-rate, and the building will include 18 bicycle spaces but no car parking. The project’s estimated cost is $4.8 million. The owner of M3 LLC could not be reached for comment, as his or her identity could not be confirmed. Planning documents list the owner’s address as the Garaventa Accountancy Corporation on Church Street. Michael Feno, the longtime owner of the deli, listed the property for $2.995 million in late August, hoping that the would-be buyer would develop the property into housing. At the time, he said his intention was to “take care of the middle class” by adding to the neighborhood’s housing stock. “As long as you’re short on housing, what are you going to have is every house with a multi-millionaire,” he said. Yet, he told Mission Local in August that any sale would be contingent on a developer including parking in the new development. With no car parking in the plans, that sticking point was apparently nixed from the deal. Feno has not yet responded to questions for this article. 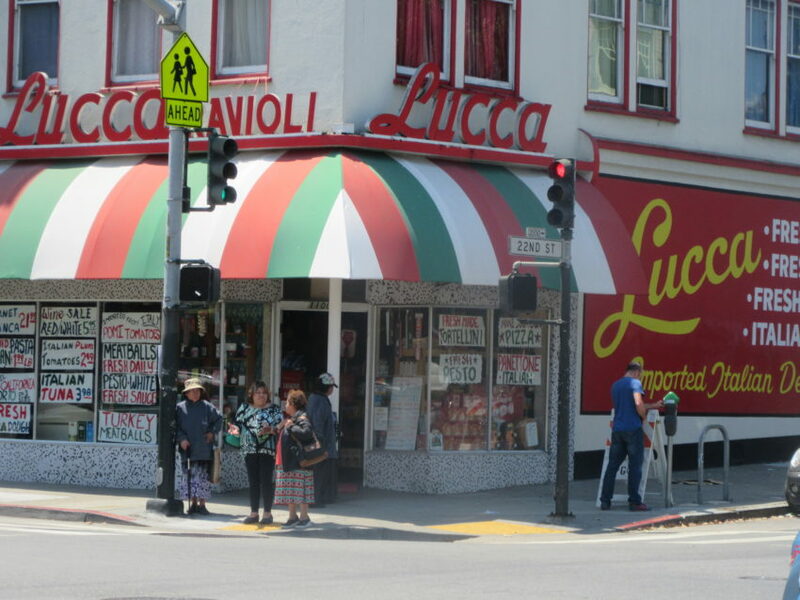 Feno’s family has run Lucca on the corner of 22nd and Valencia since 1925, eventually buying the corner building as well as the adjacent apartment building and the parking lot next door. If and when the new building is complete, it will be the tallest on the block, outsizing its neighbors, including the sprawling four-story City College of San Francisco Mission Campus across the street. Valencia seems to be a hot place to develop small housing projects: Less than block away, on Valencia between 21st and 22nd street, a six-story, 25-unit building is proposed to replace the San Francisco Auto Works garage. The deli should have been sold and leveled as well. Written into the deal should have been a clause that allowed the current second floor tenants to have a rent controlled apartment in the new building, AND the ravioli deli should hav been leased a new shop on the ground floor, at a VERY affordable rate. The deal should have also mandated that Lucca start including lettuce and tomatoes in thei sandwiches, and customers with a ticket from the Social Security Office should receive one dollar discounts on sandwiches. Maybe you can start showing up there and giving people free lettuce and tomatoes. Jon, I beg you to go back to whatever terrible place you were spawned. Lucca is a treasure. I’d like to understand why, with all the tools and technology available, especially in SF, we cannot get a better grasp of who is living in rent controlled units. I personally am acquainted with at least twenty people who are ‘legacy’ tenants. Which means they live in nice units located in great neighborhoods, and pay a pittance for them, relative to market rate. I work as a part-time instructor. Several of my colleagues live as far away as Vallejo and Stockton because they’ve been priced out of SF. Shouldn’t someone be making a tally of income versus rent? A lot of those acquaintances use their rent controlled units as ‘second homes’ as they are well heeled Silicon Valley folks. There must be many, many such units being occupied by people who can well afford market rate rent that can be freed up for use by folks who truly make very little. Why is a landlord subsidizing the rent of a person who can afford the market rate? Why are those units not being made available to others more deserving? If you want to buy a BMR unit you have to show income qualification, the exact same rule applied to rental units will really help resolve the housing shortage crisis. This is ridiculous that these people are given a free pass. Don’t you? Please have the person you just appointed to address the housing situation look into this with integrity, Mayor Breed. I reckon it gets swept under the rug because there are many people who are living in those rent controlled units who are unwilling to ‘fess’ up.. and they have the power to not shine a light on this issue or to deflect the light. If there was no rent control, you would have far more than twenty colleagues commuting from Stockton. That deli is the very definition of legacy building. I adore that deli and shop there often. I’m all for the highest building that can be built and more housing and no parking. That’s the future. I love Lucca’s. Hope the housing will go through and not be blocked by the neighbors like every other project seems to be. I hope Luccas continues in its current location for many years. They are a treasure. been going to lucca since i was a kid..i sure hope that the lot being sold wont hurt the business.. Understand about housing but why would they sell their lot? 5 story “tower”? Give me a f…ing break. 5 stories is NOT a tower. I expect better from mission local. Five story TOWER? In the sane parts of the world, the ones without a severe housing crisis, no one would ever think to call a 5-story building a tower. This is a clear example of anti-housing bias by this newspaper. Language like this is one of the many reasons why we continue to have a housing crisis with no end in sight. Please fix your headline. LOL this hacky author clutching allll the pearls over the loss of a private parking lot (nooooo! ), and crying over a proposed 5-story “tower” (gasp!) on small single lot, which according to this author will apparently “outsize its neighbors”, such as the squattish City College mega-structure across the street. City College is “only” 4 stories but with institutional floor heights, and is a single massive structure which sprawls across 9 (NINE!) city lots. Also, LOL at clickbait photo of Lucca’s facade, implying that a vibrant local business – not its adjacent vacant parking lot – is the thing being demolished and redeveloped. Are you a real person or is this performance art?